This shows "inferior" ST depression. But stress testing shows us that ST depression does not localize. In other words, when the stress test shows ST depression in an apparent distribution, it does not correlate with the echo, nucleide imaging, or cath. Thus, subendocardial ischemia, for an unknown reason, does not localize. When there is ACS with ST depression due to subendocardial ischemia, it is diffuse (II, III, aVF, V4-V6). If it is focal, one should suspect that it is reciprocal ST depression, reciprocal to ST elevation elsewhere. This is most commonly seen with high lateral STEMI, with reciprocal depression in II, III, aVF. In fact, this ST depression is usually the most obvious finding on the ECG because ST elevation in aVL is rarely pronounced (most commonly because the QRS voltage in aVL is usually very low, and ST voltage cannot exceed QRS voltage). Thus, this ECG is diagnostic of occlusion of a vessel supplying the high lateral wall. It does not meet the definition of STEMI because there is not 1 mm of STE. However, this definition is arbitrary. The purpose of the definition is to diagnose coronary occlusion. The first troponin was 0.82 ng/ml. The findings were not recognized. Subsequent ECGs did not change. The patient was admitted and did not get cath until the following day, at which time the Obtuse Marginal was found to have 90% stenosis with TIMI I-II flow. There is now a new Q-wave in aVL, with T-wave inversion. This is diagnostic of completed high lateral MI. Echo showed a new wall motion abnormality. Peak troponin I was 8.6 ng/ml. This patient presented very ill in DKA and with depressed mental status. He was intubated. 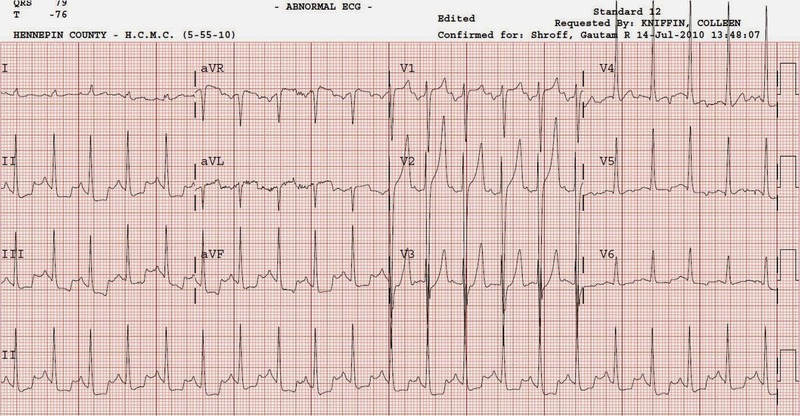 There are peaked T-waves diagnostic of hyperkalemia, but there is also suspicious ST depression in II, III, and aVF. The hyperkalemia was immediately recognized and appropriately treated. However, the significance of the ST depression was not. It is reasonable to hypothesize that the ST depression is related to demand ischemia (though in such as case it should be diffuse, not localized). If that is the case, it should resolve with therapy and improved hemodynamics and slower heart rate. The peaked T waves have resolved, and there is less tachycardia, but the ST depression in II, III, aVF persists. There is definite ST elevation in aVL. This was not acted upon. Outcome: the patient had a peak troponin of 110.00 ng/ml (very large) and was taken for angiogram the next day. It showed an occluded first diagonal. Echo showed a lateral wall motion abnormality and the EF was 55%. For clarification, is it just inferior ST-segment depression that does not localize subendocardial ischemia, or ST-segment depression in any lead distribution. Thank you. Based upon stress test data, no subendocardial ischemia reliably localizes on the ECG. This is really interesting, what is your theory as to what is happening? Ainsley, I wish I knew why subendocardial ischemia does not consistently localize on the ECG. Fortunately, reciprocal ST depression does localize the ST elevation to the opposing lead(s) (opposite wall). How rare do you think localized ischemia in inferior leads might be compared to an anterior equivalent? I think that without a doubt this blog might foster quite some future ECG researchers. Repolarization voltages (ST-T) should always be proportional to depolarization (QRS) voltages. A small amount of ST elevation in the context of a small QRS is significant. A large amount of ST elevation or depression in the context of high voltate QRS (such as LVH) may not be significant. In the Case 1 ECG 1 I see a bit of ST depression in V4-V6. Minimal and very normal to my eye. - lateral STEMI results in STE in 1, AVL, v5 and V6. These findings alone could be a lesion affecting diagonal branches of LAD; or a lesion affecting the Obtuse marginal branches of LCx. - usually, STE in these leads is accompanied with STE elsewhere which helps localize: additional anteroseptal involvement suggests LAD; additional inferopostero involvement suggests LCx. - 1, AVL (high lateral) STE without any other findings, is typically D1 of the LAD. But could be OM of LCx. - v5,V6 STE without any other findings is typically OM of LCx. But could be D1 of LAD. Good summary. I would add that V5 and V6 are a bit different than I and aVL: V5 and V6 are more inferior-lateral, whereas aVL is high lateral. Inferior MI from RCA may have lateral branches that result in STE in V5 and V6. In our study of 150 inferior MI, 33 had this (can't remember how many were RCA vs. circ though).